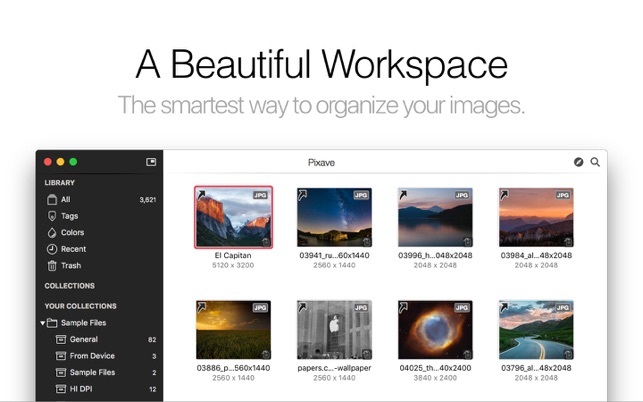 Pixave is the ultimate image organizer. The updated version includes the new Light/Dark user interface with the Collection now supporting auto-import, while the Smart Collection and System Collection has become more powerful and refined, providing this new version with an even more convenient and user-friendly workspace. You will be amazed at such useful features. Pixave’s innovative and useful workspace lays the groundwork for you to draw inspiration, unhindered, from your images - because your inspirations are precious and beautiful. Specified media, along with tag information, can now be automatically imported from a designated folder. To import, images no longer need to be dragged, images no longer need to be clicked to apply tags, and image types no longer need to be separately categorized. Just place your desired files into the designated folder and Pixave will automatically import the selected media and automatically apply selected tags. Now importing media is taken care of automatically. How convenient! Adding and searching for tags is a piece of cake. Many tags can be applied immediately to a number of images, and can be searched for along with its tag. Pixave’s new Tag system really is quite something. During import, not only are the keywords included in the image identified and automatically added to the tag, but tags added by the user can also be very easily applied. For tagging, simply drag the tag to an image or vice versa. This way of adding new tags or searching for tags provides a fresh approach in accessing them. Beware to not become overwhelmed by the incredible new tagging interface – the ability to apply numerous tags simultaneously to numerous images. 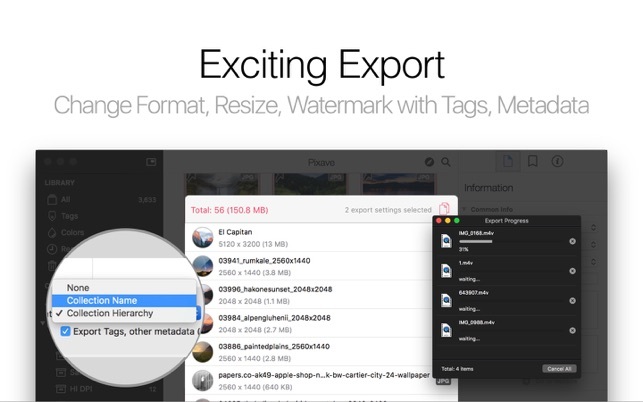 Even exporting has evolved. Alongside the basic function of exporting according to image type, you can also adjust the image size in set increments, customize the file naming pattern and apply Watermarks. Tags you have inserted and managed are now also included within the image during export. And the ability to create ePub files is, no doubt, a bonus. - Fixed a problem where Rename UI didn’t be shown correctly. - Improved scroll position when import complete. 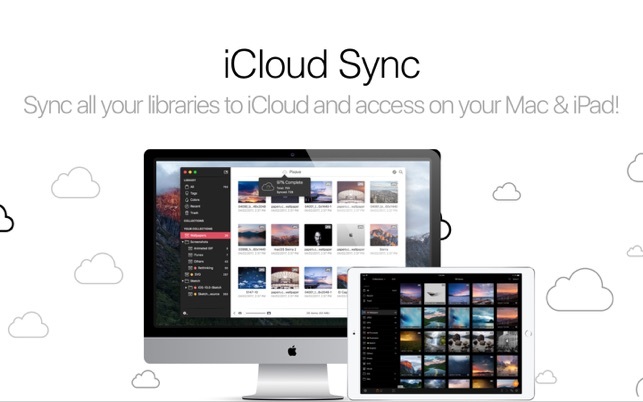 - Added ability to backup library in iCloud for the future updates. - Fixed a problem where sorting value in browser didn’t save correctly - Fixed minor issues. By the way, App Store reviews are very helpful to us. 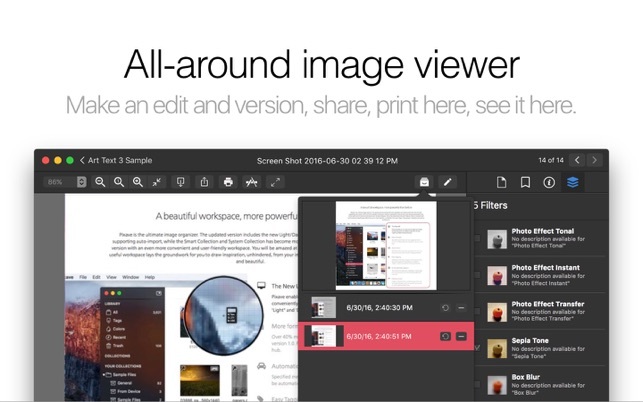 If you think Pixave is worthy, would you mind taking a moment to write a nice review? We’d greatly appreciate it. Thanks for using Pixave. 1) Right out of the box it was confusing how to *import* images - I had to create a collection to put them in (as opposed to just dragging and dropping images on the app). 2) Showing search results in a side panel is terrible - you see unuseful thumbnails in the panel to alongside all the thumbnails in your current collection. 3) The Chrome extension does not work. At all. 4) When you want to snap a webpage, it opens a completely new window - it’s not at all clear how to get back to your image library (it’s a tiiiiny arrow that’s easily missed). Don’t get me wrong - the app’s performace is great, and there a lot of features. Probably too many, which is the issue. The app feels more like a developer’s tool than a designer’s tool. 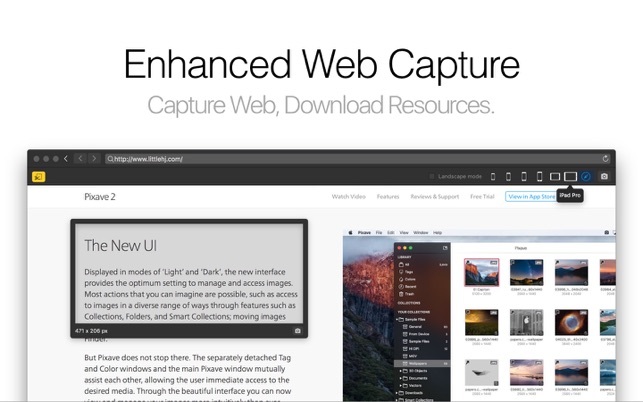 The core tasks of importing, searching and snapping screenshots are just not that great. I would go back to Ember in a heartbeat, but with it’s future so uncertain it is time to move on. Seems like the field is still wide open for a great Ember replacement. 1) It's *extremely* fidgety to set the width of a webpage before capturing it and is a process of trial-and-error. 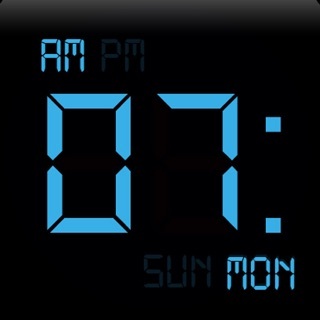 A numeric entry box and/or pop-up with defaults would be great. Pixave has motivated me to get more organized! I love how you can organize images and files by type (screen, phone tablet, web, etc, web, icon, interface, etc), using keywords and colors to designate and define your content. The export to epub option is a nice bonus. I’m updating my review because I’m exciting that Pixave is now available for the iPad (and coming for the iPhone very soon). It syncs with iCloud Drive which is very convenient!